Catalog : Pascual Reverte S.L. The Pascual Reverte factory, which produces genuine saffron from our region in Spain, has the flexibility to create different products if necessary, including private label. The food industry will find in our variety of packaging the adequate sizes for their specific needs. 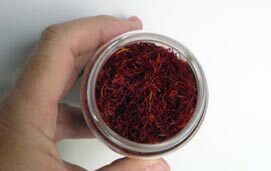 We export three varieties of Spanish Saffron: Threads, Coupe and Powder. The Coupe quality is included in the ISO I Category. Tins of: 5 K, 1 K, 1 Oz., 20 g.